These stanchions with retractable dark green belt are great for creating service lines and separate dining areas. Each post is made of strong metal with a satin black finish. 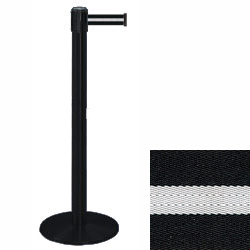 The stanchions with dark green belt' neutral appearance makes them great for any restaurant, retail store or event venue. 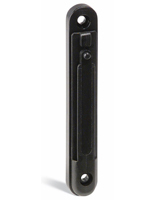 With the crowd control pole's 4-way adapter on top, they can connect to three other stands to create lines and complex layouts. The stanchions are part of the Tensabarrier series and are compatible with accessories like sign holders and buckets found on this site. The crowd control posts' round weighted base makes them highly stable for use in high traffic areas.